Born: 30 March 1734, The Netherlands. Died: 21 April 1812, Neuwied, Koblenz, Germany. Cornelis J. van de Graaff, governor of the Cape of Good Hope, was the son of Sebastiaan van de Graaff, a Dutch cavalry officer, and his wife, Geertruid van Vinceler. Like his father he entered the cavalry, but served in the engineering corps. He was appointed engineer extraordinary at 's Hertogenbosch in April 1759. In October 1766 he married Hester C. Reynet, with whom he had two daughters and two sons, one of which was the engineer Sebastiaan W. van de Graaff*. 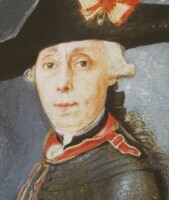 By 1784 Cornelis was an engineer second class, held the rank of lieutenant-colonel, and the post of comptroller-general of fortifications of the province of Holland. In that year, probably because he was close to William V, Prince of Orange, he was appointed governor of the Cape of Good Hope. He arrived at the Cape on 22 January 1785 and started improving and expanding the defence works around Cape Town. The plans were drawn up by L.M. Thibault*, D.M. Barbier* and his son Sebastiaan, while the work was supervised by Thibault and Barbier. An attempt was also made to improve the security of the north-eastern part of the colony by establishing the town and district of Graaff-Reinet in 1786. The town was named after the governor and his wife. As an integral part of his military activities Van de Graaff made a major contribution to the cartography of the Cape by ordering and supervising an extensive programme of surveying and mapping, led by his son. In addition to Thibault and Barbier, who came from the Netherlands with him, he also employed J.W. Wernich*, J.C. Frederici*, C.H. Leiste*, J. Jones*, and F.R. Duminy*, who were already at the Cape. He began by collecting all the maps available at the Cape and systematically set about copying and improving them. Most of the surveys he ordered were aimed at mapping the bays of the colony and its coastal regions, and the resulting maps were generally of a high cartographic standard for their time. In fact, at the close of the eighteenth century the Cape was probably the best mapped region of the world outside Europe. Van de Graaff himself contributed significantly to the compilation of three of the maps in his collection. The most important of these was an improved map of the colony, based partly on the map drawn up after governor van Plettenberg's journey in 1778. It had the somewhat misleading title Caart van den oostelyken oever en aangelegen landen van Afrika, behorende onder het gouvernement aande Caap de Goede Hoop (Map of the eastern coast and adjacent lands of Africa, belonging under the government at the Cape of Good Hope), but covered the whole colony except the environs of Saldanha Bay and Cape Agulhas. The scale was about 1:570 000. This map, compiled by van de Graaff during 1785-1794, was one of the first to provide a proper overview of the whole colony and was just as accurate, but more detailed, than similar later maps by J. Barrow* and M.H.K. Lichtenstein*. The other two maps by van de Graaff were a sketch map of Saldanha Bay, indicating the positions of the Dutch and English fleets at the time of the British annexation of the Cape in 1795 (completed in 1796); and an updated map of the colony, on three sheets, based on an earlier map by C.F. Brink* that showed J.W. Cloppenburg's journey of 1768 into the interior (completed in 1798). Van de Graaff had the reputation of being an able military officer, but was headstrong, had a violent temper, maintained an extravagant lifestyle, and was careless in business matters. He was often involved in disputes, among others with Colonel R.J. Gordon*. During his term of office economic conditions at the Cape deteriorated. He issued large amounts of paper money, leading to high inflation, and although an illusion of wealth was created there was a serious shortage of grain and other basic commodities. The Dutch East India Company also began to economise in 1790, among others by reducing the number of soldiers stationed at the Cape. Van de Graaff had to sell his estate at Newlands and was recalled to the Netherlands. He left the colony in June 1791, taking his whole collection of unpublished maps with him. These were later rediscovered in the archives of the Dutch Topographic Institute at Delft and described by C. Koeman (1952). Van de Graaff was promoted to major-general in 1794. When the Batavian revolution broke out in 1795 he left the military and fled to Germany, where he remained for the rest of his life. Theal, G.M. History of South Africa under the administration of the Dutch East India Company (1652-1795), Vol. 2. London: Swan, Sonnenschein & Co., 1897.